Father daughter duet – Subhani singing with Pandit Amaradeva. Minister Vasudeva Nanayakkara appreciated the outstanding musician and he thanked India emphasizing the fact that the relations between India and Sri Lanka are vital in every manner. Indian High Commissioner Ashok K Kantha also addressed the audience in an emotional way stating that they are proud to felicitate this towering figure in music. He mentioned it is an important moment which would help increase the cultural affinity between two countries. 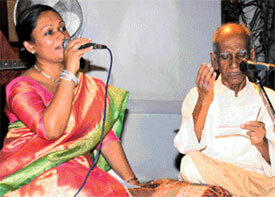 External Affairs Minister G L Peiris mentioned that Pandit Amaradeva is the greatest musician in the country. "Pandit Amaradeva's song Mage Deshaya Avadi Karanu Mena is ideally appropriate to Sri Lanka at the moment since we now rediscover our own values," the minister added. 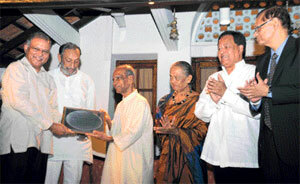 The High Commissioner presented a memorial plaque to Pandit Amaradeva. Distinguished invitees such as Professors K N O Dharmadasa, Carlo Fonseka, Ashley Halpe and President's Secretary Lalith Weeratunga also graced the event.